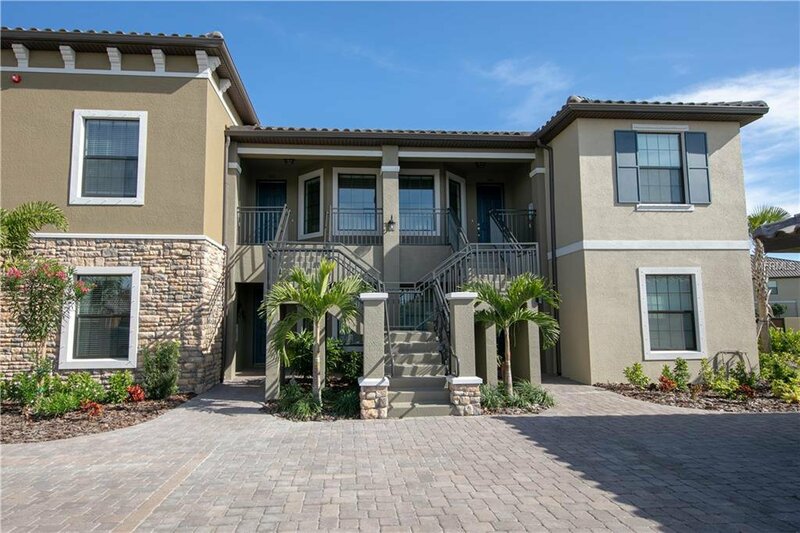 Beautifully appointed Golf Condo in Esplanade at Lakewood Ranch resort community overlooks the 10th Green with stunning water views and scenic landscaping. WHAT A VIEW! This Taylor Morrison Bacciano II is a very popular floor plan with 1616 sq ft. Come see the 2 bedrooms, 2 baths and flex space that can be used as an office or den or third sleeping space. When you walk into the living area and out on the lanai, you feel a part of nature.The designer upgraded kitchen & bath offer white 42" cabinets with granite counter tops & back splash. The over-sized kitchen island opens to the dining room. This splendid unit has 5 all new upgraded ceiling fans and lighting. The Master Suite includes dual sinks, large shower and 2 large walk-in closets. Your guests will enjoy staying in the spacious bed & bath in front. Amenities & activities abound in this community. Large lagoon-style pool & spa, plus a resistance pool, lap pool & 2 fitness centers. Kayaks are stored next to the adjacent pond for you. Work-out in the wellness center & relax with a massage or swim in the resort style pool with the Bahama Bar with a great menu. Close by are tournament tennis courts & pickle ball courts. Enjoy the brand new Clubhouse & Culinary center in March. This is the all-inclusive resort lifestyle you deserve. Landscaping maintenance is included along with a full golf & club membership. Located minutes from I 75 & LWR Town Center, UTC Mall & every service you can desire. Come see & join the fun! Listing courtesy of COLDWELL BANKER RESIDENTIAL RE. Selling Office: KELLER WILLIAMS REALTY SELECT.